Every so often a piece of space junk comes dangerously close to the International Space Station. When that happens, the ISS crew takes shelter in the stations' two escape pods, waiting until the debris zips past and Mission Control gives the "all clear." A tiny fleck of paint created this crater on Challenger's windshield. The last time that happened was this past March, when Mission Control woke the sleeping ISS crew to send them scrambling for the escape pods. A piece of a smashed Russian communications satellite, Kosmos 2251, passed within nine miles of the ISS. 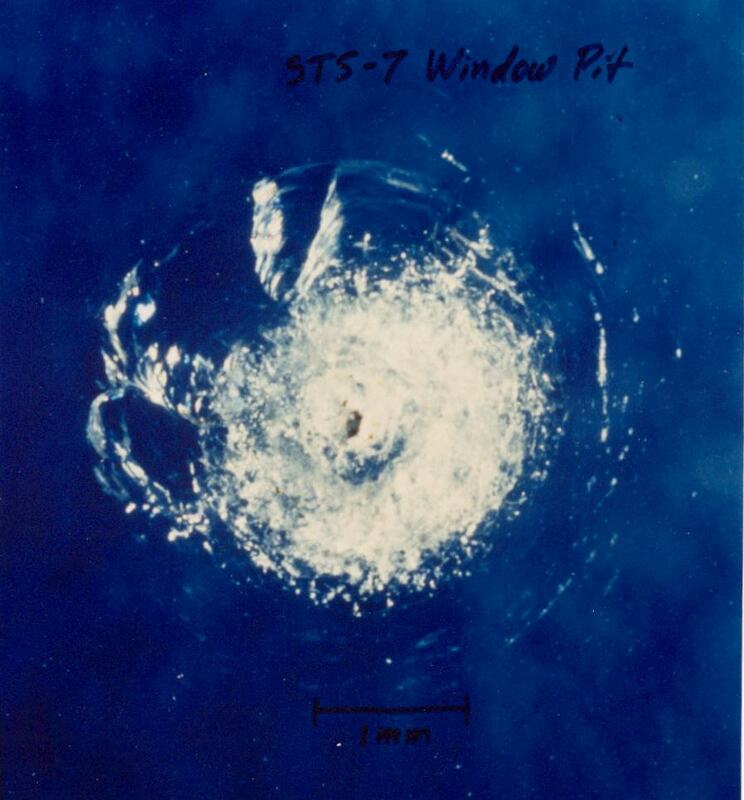 That doesn't sound particularly close, but apparently the small size and erratic orbit of the Kosmos debris made it hard to track, necessitating caution. 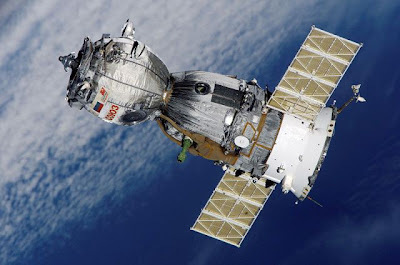 The Soyuz TMA-7 spacecraft, similar to the ISS's Soyuz escape pods. It's not a big surprise that a piece of Kosmos 2251 nearly crossed paths with the ISS. Back in 2009, that particular satellite accomplished a dubious "first" in space travel: it was the first man-made satellite to collide with another man-made satellite. 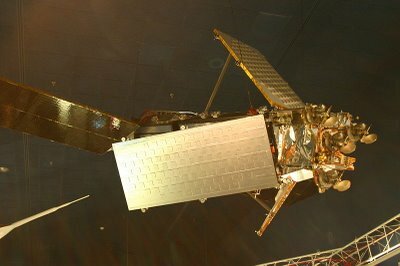 Kosmos 2251 had been out of service for over a decade when its degrading orbit placed it directly in the path of the U.S.'s Iridium 33 communications satellite. When they impacted, Kosmos weighed over 2,000 pounds; Iridium weighed over 1,200 pounds. Their relative speed was over 26,000 miles per hour! While Iridium 33 was a functioning satellite at the time of the impact, it (obviously...) stopped working after getting smashed to bits by Kosmos 2251. Iridium (Green) and Kosmos (Red), colliding over Northern Siberia. This lead me to another question: did we know this crash was coming? As in, could it have been avoided? The company Analytical Graphics runs a satellite tracking website analyzing space junk collision risks. On February 10, 2009, the day of the collision, AG's Celestrak website calculated that the two craft would have a close encounter, passing within 1,916 feet of each other. But this close encounter was not even predicted to be the nearest miss of the day. Therefore, it wasn't deemed worth the expense and expenditure of limited fuel resources to nudge Iridium a little further out of the way. Kosmos 2251, back when it was in one piece. I guess would have become clear that the 1,916 feet calculation was a bit off when Iridium (and some people's satellite phones...) stopped working at the moment the pass was predicted to occur! Sources: Celestrak; Wikipedia; NASA; Space.com; NASA Television. "The thing that I'll remember most about the flight is that it was fun." Dr. Ride in high school. From everything I'm reading, it sounds like Dr. Ride was a very private woman. 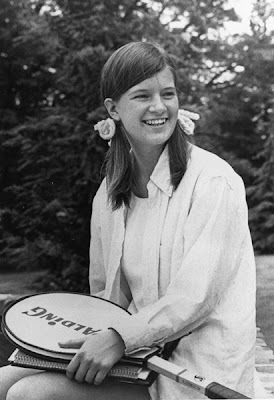 But, this article shares a few neat facts about her that I hadn't known. For instance, Dr. Ride was on a commercial flight when Challenger exploded. The pilot announced the Challenger news over the intercom, so she walked up to the cockpit, flashed her NASA badge, and they let her sit with them and listen to the news come in over the radio. She'd already flown on the Space Shuttle twice at that point, and never went into space again... though dozens of other American women have. 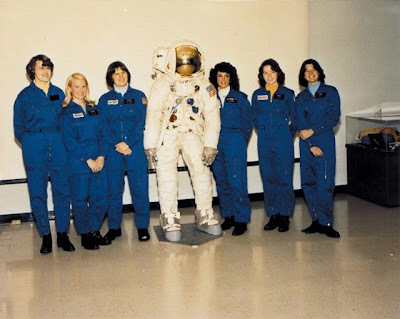 NASA's first six female astronauts! 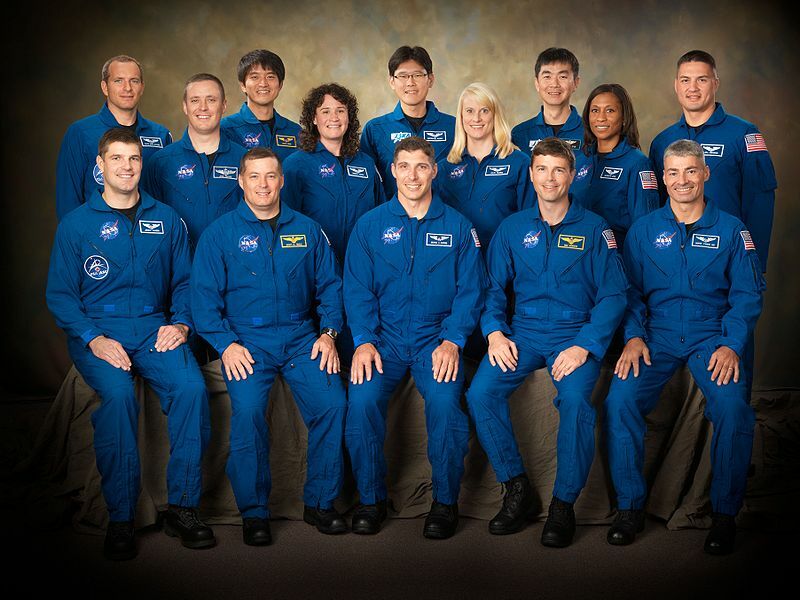 I just checked with good ol' Wikipedia, and it tells me that 3 of the 14 NASA astronauts who completed the most recent training class last fall are women. The youngest Group 20 Astronaut Candidate, Kathleen Rubins, was just 5 years old when Dr. Ride flew on STS-7! 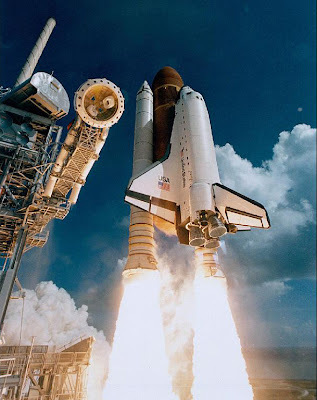 An hour of NASA footage on Dr. Ride's first mission, STS-7. Source: Wikipedia, Boing Boing, Sally Ride Science, YouTube, New York Times, Mental Floss. 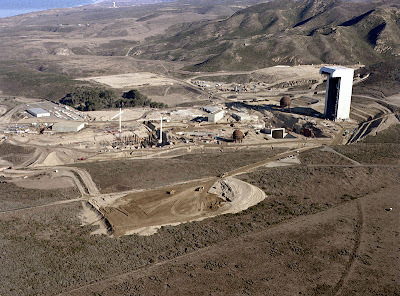 In a few recent posts I've talked about how Vandenberg Air Force Base in California came within a few months of being used as a launch site for space shuttle missions. 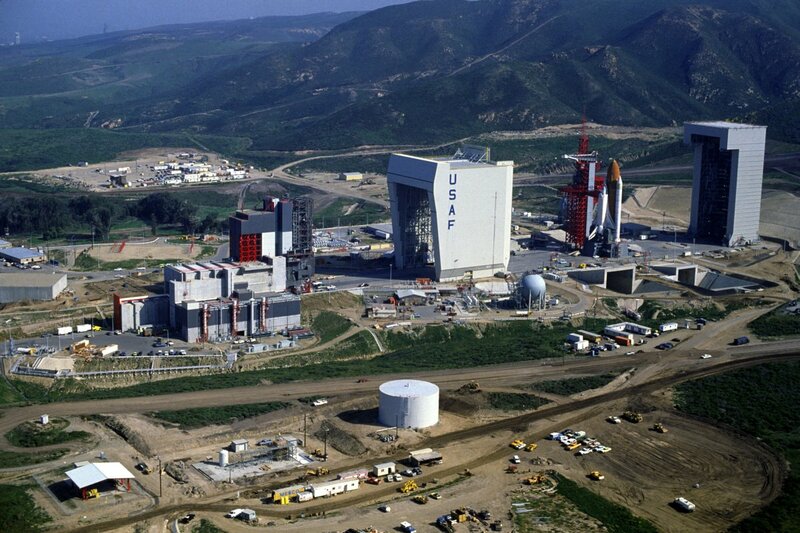 But after the 1986 Challenger disaster, the Vandenberg launch program was cancelled. The planned Vandenberg launch site. But that's not to say that Vandenberg isn't still used for unmanned launches... launching from the Vandenberg AFB is perfect for achieving a polar orbit. Polar orbits are ideal for Earth-observing satellites because they allow you to look at any point on Earth, during daylight, during any given 12 hour period. In contrast, launches from Cape Canaveral never pass over locations above or below 57 degrees latitude. So, the International Space Station, which is accessible from a Cape Canaveral launch, never passes over most of Alaska, or any of Finland, or the North Pole, or Antarctica. But a polar-orbiting satellite would. By the way, you can track the International Space Station in real time here. Polar orbits: preferred by the U.S. Air Force and Santa Claus. It's not safe to launch a spacecraft into polar orbit from Cape Canaveral because the rocket will launch north or south, straight up the east coast and over all the cities there, or down the Florida peninsula and over all the cities there. But, from Vandenberg you can launch due south over the Pacific, without flying over a single inhabited bit of land for hundreds or even thousands of miles. So that's why polar orbits are useful, and why Vandenberg would have been the preferred spot for a polar space shuttle launch. In his biography, astronaut Mike Mullane (a retired Air Force colonel) gives his take on the the Air Force's interest in the Vandenberg space shuttle program and U.S. manned space flight in general. To sum it up, Astronaut Mike thinks the Air Force wasn't too interested in manned space flight at all. As a result, the Air Force did not lobby on behalf of Air Force astronauts or space shuttle funding to the degree it could have. The Air Force's lack of interest affected Mike personally, so he has a lot more to say about it than I just did... but you get the idea. 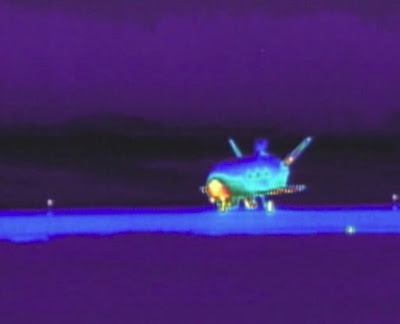 The Air Force's classified mini-space shuttle, just after landing. However, that's not to say that the Air Force isn't interested in unmanned space flight. 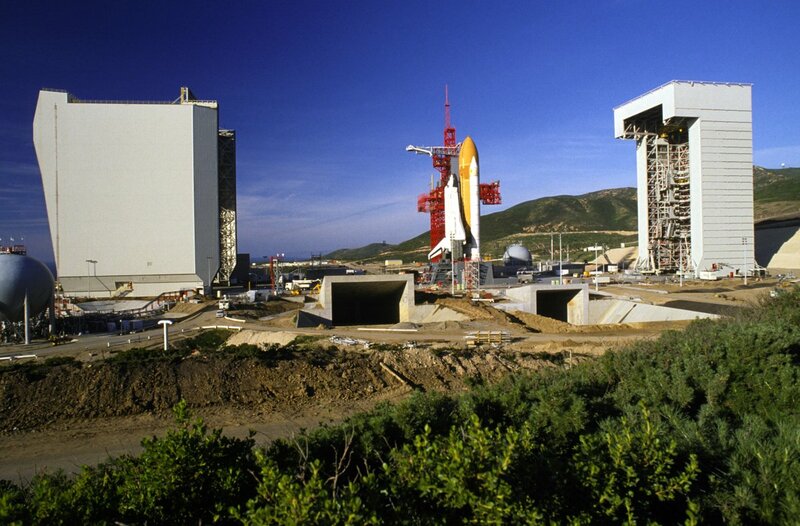 Even though the Vandenberg launch site was never used for the space shuttle, it is playing a role in the missions of the Air Force's classified, unmanned space shuttle, the X-37B. The X-37B, just after landing at Vandenberg. 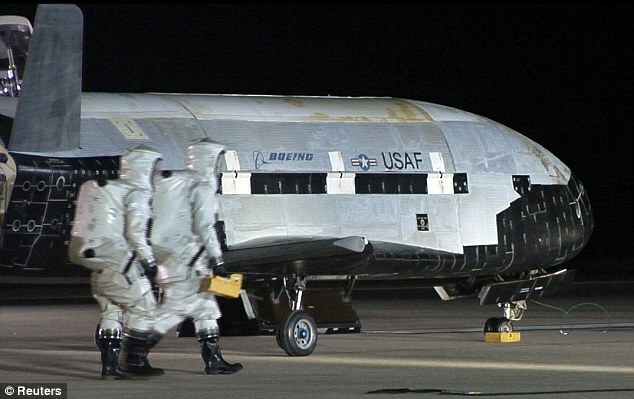 Both of the X-37B's missions to date were launched from Cape Canaveral, but landed at Vandenberg! I wonder if there are plans to launch X-37B missions from Vandenberg any time soon? 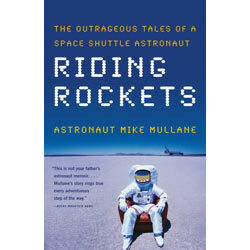 Sources: Mike Mullane, Riding Rockets; NASA, I.S.S. Tracker; Wikipedia; Space Flight Now. 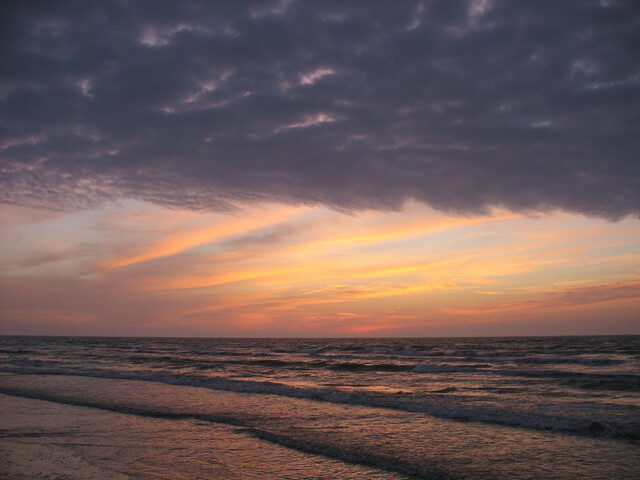 Matagorda is a sleepy little beach town on the Gulf Coast of Texas, roughly 100 miles southwest of Houston. Situated near the Big Boggy National Wildlife Refuge, it's a good spot for a vacation or a fishing trip... and, I'll add bitterly, it's 5 degrees cooler there right now than it is here in Chicago. A busy day in Matagorda, Texas. 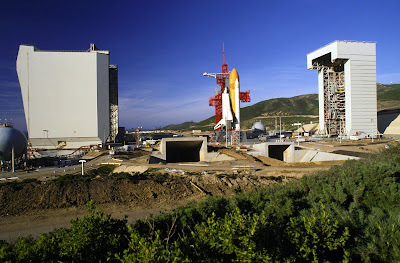 Oh, and I should also mention... back in the 1970s, Matagora almost became the launch site for the space shuttle! When NASA was choosing launch sites for the space shuttle, most of the contiguous United States was initially under consideration. 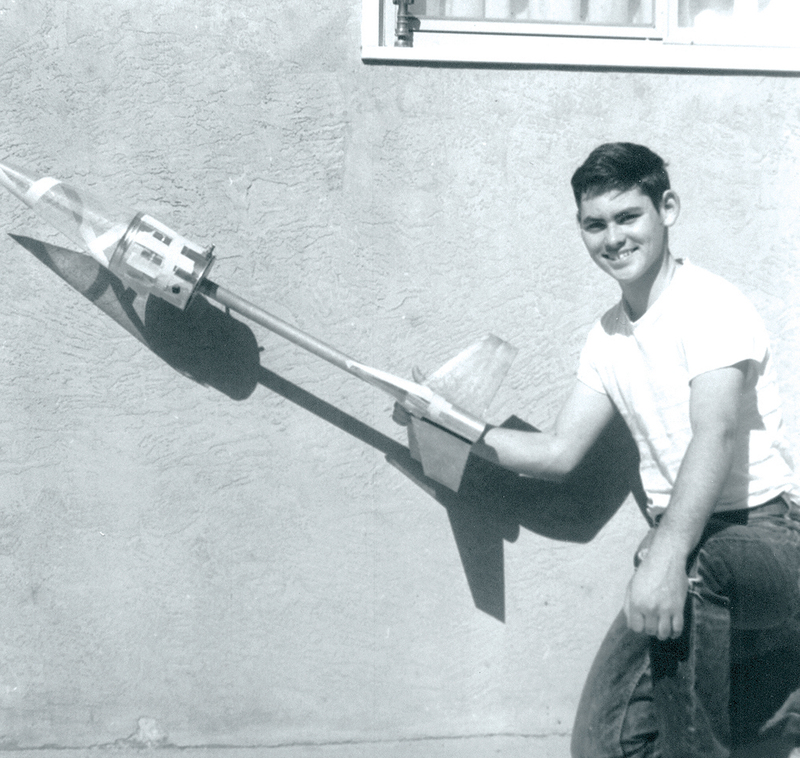 The main limiting factor in choosing a launch site was safety. 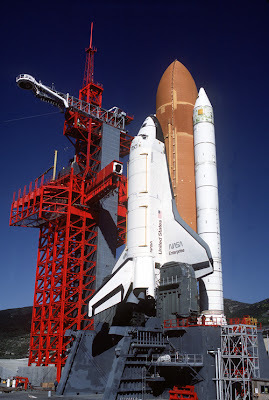 The shuttle shouldn't launch over populated areas, since that could result in the solid rocket boosters (or the shuttle itself, in an accident) crashing onto inhabited areas. An Orion rocket, launched from Wallops Flight Facility in Virginia. This limitation ruled out pretty much any location that wasn't near a big body of water- leaving only the west coast, east coast, and gulf coast. Further, population centers dot most of these coastal areas. Only five spots made the final cut: Cape Canaveral (coastal Florida), Vandenberg Air Force Base (coastal California), the Chesapeake region in Virginia, coastal North Carolina or South Carolina, and Matagorda, Texas. 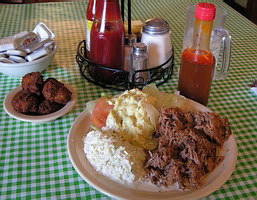 If NASA had made its final decision based on barbecue quality among the five sites, we'd have spent the past thirty years watching shuttle launches down east in North Carolina. But (unfortunately?) that is not how the launch site decision was made. 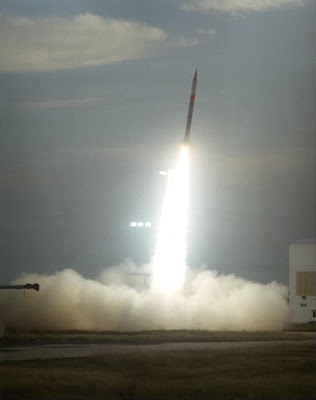 North Carolina, South Carolina, and Virginia were ruled out because areas near potential launch sites in the three states were just too populated, so it would have been too expensive to buy enough land to create a safe launch zone. That left Matagorda, Vandenberg, and Cape Canaveral. Matagorda actually had a few advantages over Vandenberg and Cape Canaveral. The Cape can be used for eastern launches, but not polar launches. Vandenberg can be used for polar launches, but cannot be used to launch rockets towards the east (which is the most fuel-efficient direction for a launch). Matagorda could be used for either type of launch. But, a cost analysis concluded that it would still be cheaper to equip both Vandenberg and Cape Canaveral for space shuttle launches than to build an entirely new launch site out of nothing in rural Texas. So, at the end of the day, Cape Canaveral and Vandenberg were chosen. 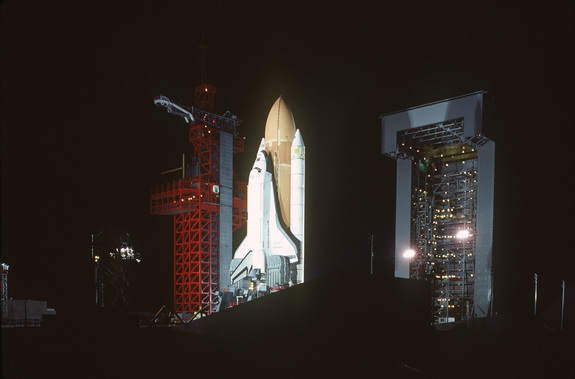 The Enterprise on the launchpad at Vandenberg AFB, back in the early 1980s. 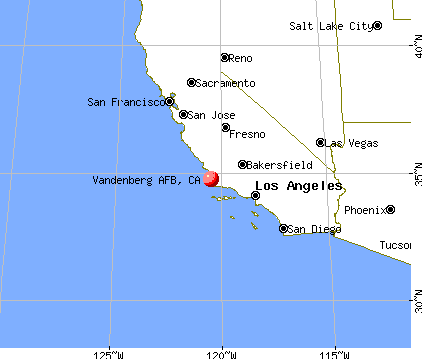 Sources: The Space Shuttle and Vandenberg Air Force Base; NASA, Wikipedia. Last Tuesday my boyfriend and I stayed stayed up till almost 4:00 AM watching the official announcement of the Higgs boson discovery! CERN press conference announcing the discovery of the Higgs. The Higgs discovery was made in tandem by two different CERN research groups. The boyfriend (who's a physicist) was familiar with one of the group's research results before last week. So, when the second group's results were announced, but before the press conference, he calculated that the two results taken together would prove almost beyond a doubt that the Higgs exists. 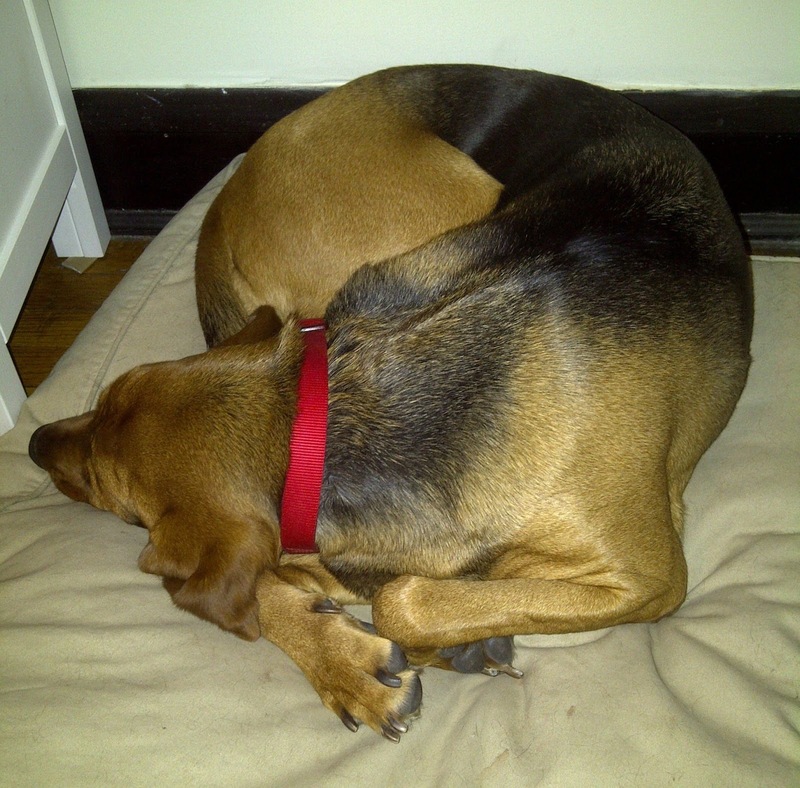 Our bloodhound (who's not that into science) slept through the announcement. 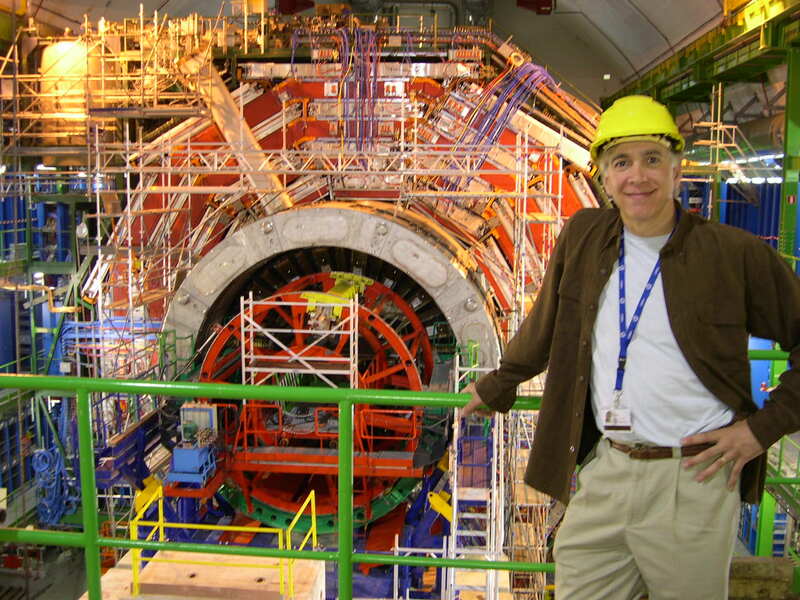 You could be pretty sure after the first group announced its results that the Higgs existed. But combine that level of certainty with the second group being pretty sure they found the Higgs too... and all of a sudden we can be 99.99% (or more) confident that we've found the Higgs. YAY! The press conference was great. The representative of the first group, Dr. Joe Incandela, a UC Santa Barbara professor, was nearly jumping out of his skin as he spoke, he was so excited. What a big day for those guys! 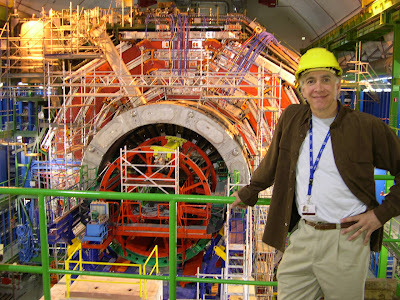 CERN Researcher Dr. Joe Incandela and (I think?) a CMS detector. We popped a bottle of champagne to celebrate. 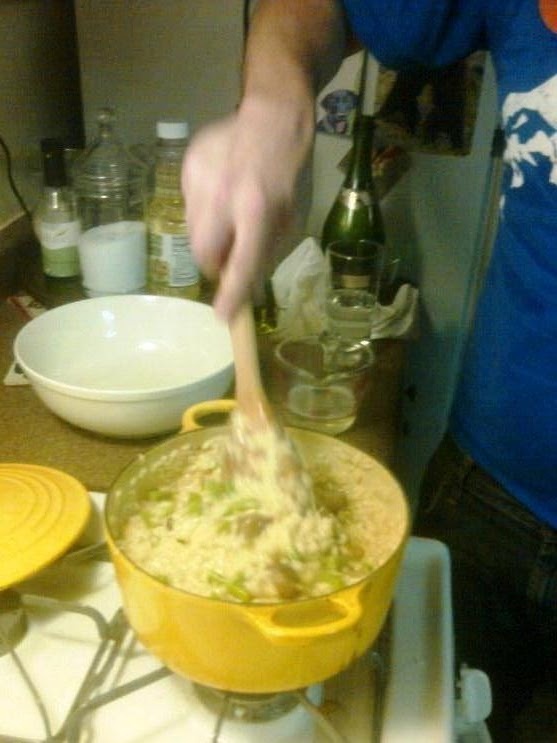 The next day I used the leftover champagne to make champagne risotto (recipe available here- I recommend adding portobello mushrooms to it). It was really tasty. Higgs boson risotto. The boyfriend is good at physics AND cooking! So tasty, in fact, that we made the risotto again just yesterday. No new elemental particles to celebrate this week, but YUM! Sources: The Guardian, Wikipedia, the dog. I visited Alaska last week. It was awesome. I was there for work, but I stayed on for a few days for some hiking, biking, rafting, and close encounters of the moose kind. 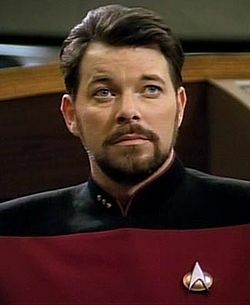 Before I arrived in the state, I already knew one important 'Alaska + outer space' fact: it's the future birthplace of Commander Will Riker. He's from Valdez, Alaska, according to sources on the internet that are at least as nerdy as this blog. 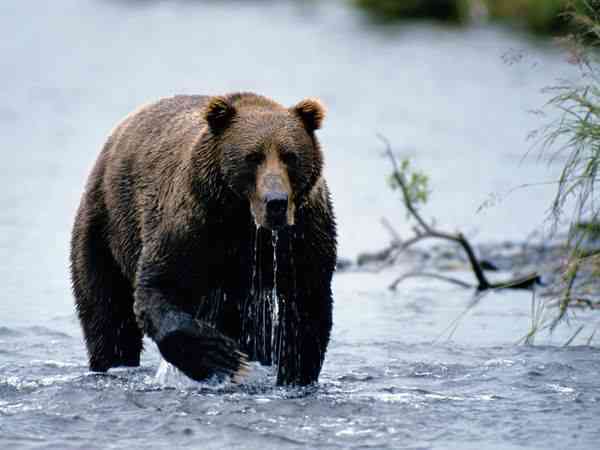 Did a bear teach him Anbo-Jitsu? But Alaska isn't waiting around until the 24th century to contribute to space exploration! It has its very own space port, right now! And apparently it's a bit of a boondoggle? 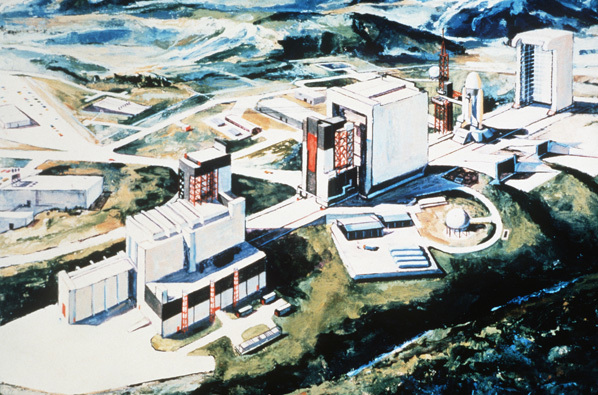 The Kodiak Launch Complex, located on Kodiak Island and operated by an Alaska state-owned corporation, has handled less than 20 launches since it was opened in 1991 (and maybe as few as 15- it was hard to find up-to-date statistics). Home of the Kodiak Bear and the Kodiak Launch Complex. There's only one launch scheduled for the Complex for this whole year. For comparison, Spaceport America in New Mexico has already had 8 launches since it opened in 2008. Good at catching salmon; bad at launching rockets. What is the (alleged) justification for a spaceport in Alaska? Apparently the location offers more fuel-efficient access to high-inclination orbits. And it's the U.S.'s only option for launching a satellite into a high-inclination orbit without shooting the rocket out over land. A high-inclination satellite passes over more northern latitudes than a low-inclination orbit. The highest inclination orbit is a polar orbit, passing directly over the north and south poles. I have a high inclination to visit Alaska again. Is the Kodiak Launch Complex really necessary? It has the best corporate motto I've ever seen ("From the Last Frontier to the Final Frontier") but is it worth the expense? It seems to be fairly unpopular. There's a group of concerned citizens blogging about the cost of the Complex relative to how little it is actually being used (and thus how little revenue it is producing). Kodiak Launch Complex: coming up roses? View: wild roses & forget-me-nots. But maybe that is about to change. Earlier this year, Lockheed-Martin picked the Complex to launch a series of medium-lift rockets. The company pledged $100 million in financing for the Complex ... in conjunction with $25 million more in spending by Alaska. Right now folks are waiting on Lockheed to finalize its business plan and find customers. Launch plans, moving at a glacial pace? View: a glacier near Whittier, AK. Sources: Alaska Aerospace Corporation; Wikipedia; Space Pork Kodiak; Space Pork Kodiak; KTVA Alaska; Alaska Daily News.